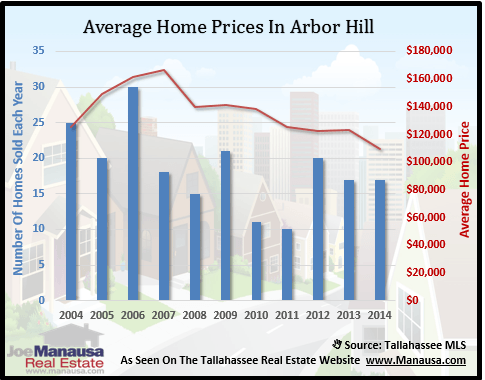 Located along the southern boundary of Killearn Estates, one can find both Arbor Hill and Arbor Hill Patio Homes, with roughly 500 properties collectively that have been consistent performers among the top selling neighborhoods in the Tallahassee real estate market. 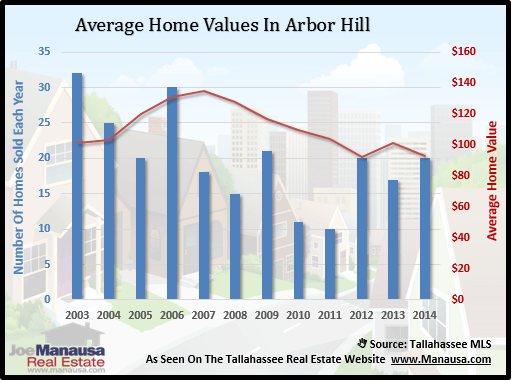 While it does not produce the numbers like the top five subdivisions (Southwood, Golden Eagle Plantation, Killearn Estates, Killearn Lakes Plantation and Bull Run), Arbor Hill does see enough home sales to often times drop into the top 20 most active neighborhoods in the Tallahassee MLS. Thus far in 2014, Arbor Hill ranks tied for #11 based upon 5 home sales with an average sales price of $119,580 and a value of $96 per square foot. That means you are getting a 1,248 square foot home for just under $120K in a highly desirable NE Tallahassee neighborhood. Currently, there are 9 homes for sale in Arbor Hill, 3 of which are already under contract. In the graph below, we see the number of closed home sales each year as blue columns (2014 is through 3/30), and the average home value, expressed as price per square foot, is shown as a red line. Similar to what we recently reported about home sales in Killearn Acres, we see that average home values continue to decline since the height of the housing market. Average home prices have moved fallen fairly consistently with home values since the peak was reached back in 2007. While this isn't going to last forever, the current inventory of homes in Arbor Hill suggests that a rise in values won't be happening this Spring. I suspect somebody who buys a home today in this normally hot part of the Tallahassee real estate market will look pretty wise in a few years. The following map shows the Arbor Hill homes that are on the market today. If you want more information on a particular home, simply click on the marker on the map and it will open up the listing to show you up to 25 pictures of each home. The following is a list of all homes sold in Arbor Hill (recorded in the Tallahassee MLS). I hope you were able to learn something from this Arbor Hill Home Sales Report, please drop me a note if you have any other questions or concerns that I can help you with.